Uta Barth, Installation view at Tanya Bonakdar Gallery, New York, February 9 March 11, 2017. Photography: Jean Vong. Courtesy the artist and Tanya Bonakdar Gallery, New York. NEW YORK, NY.- Tanya Bonakdar Gallery is presenting the newest exhibition by MacArthur Fellow Uta Barth, on view from February 9th through March 11th, 2017. Her tenth exhibition with the gallery consists of two distinct yet related projects: In the Light and Shadow of Morandi and Untitled 2017. Both projects are continuations of a career long engagement with and exploration of visual perception. While her influences span the history of painting, sculpture and installation art, particularly that of Minimalism and the Light and Space movement native to her adopted home of Los Angeles, she has primarily employed the medium of photography, as she continues to be fascinated by the strong similarities and differences between camera vision and that of human eye and mind. The first floor gallery shows her latest project, In the light and shadow of Morandi." Inspired by her love of Morandi's prolonged practice of repetitiously rendering the same subjects in the same space and his tireless attention to the slightest changes of light and form, Barth now continues her turn from observer of existing light to her newer practice of intervening in the scene and actively drawing with light. But Morandi serves only as a jumping off point, as her new images, ambiguous as to their making, render a new type of glowing luminosity and color, reminiscent of that seen in stained glass windows of old. She carefully manipulates everyday glassware to refract and reflect light, allowing it to spill onto the background as if it were liquid or paint. The luminous image-objects are presented in irregular shapes, a welcomed albeit ironic byproduct and solution to a uniquely photographic problemextreme parallax distortion. The unconventional shape of the image is the result of photographing these shadow tableaux from extreme angles and then restoring a frontal view after the fact. Here again the work foregrounds and embraces the the oddities of camera vision that human perception so elegantly compensates for. 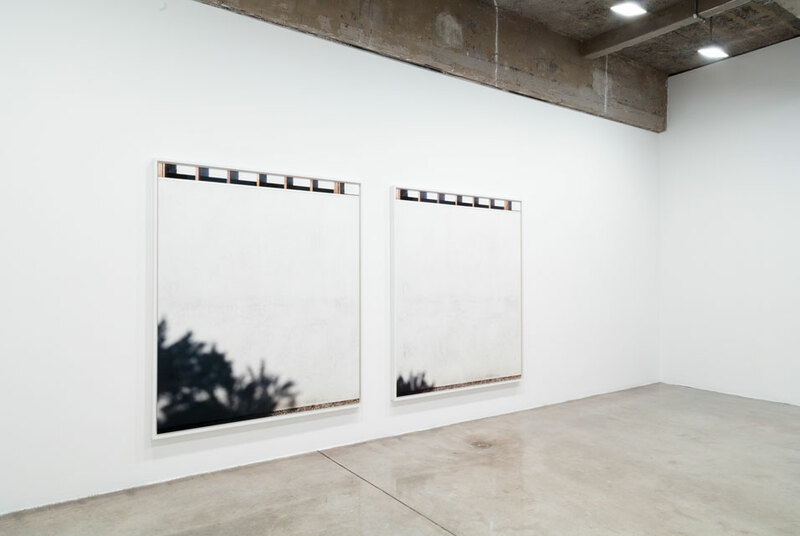 The second project on view, "Untitled 2017," is part of a series of large scale and acutely sharp photographs that describe the slightest changes of light, humidity and time as seasonal changes play out across a section of the seemingly plain white exterior wall of the artists studio. The subtlety of these changes demand and reward the closest attention to detail, as they embrace emptiness, blankness, stillness and the contemplation for which the artist is best known.